For the unforgettable moments in your life, celebrate with an expression of your love: a 0.30 Carat t.w. Diamond anniversary wedding band. 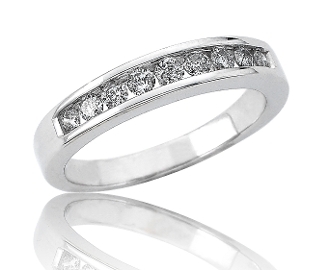 With unsurpassed brilliance, express your commitment to marriage, and exchange vows with the beauty of 9 sparkling Diamonds channel-set along this 14 Karat white gold band.